When was the earliest ice breakup year for Western Hudson Bay polar bears? Posted on June 17, 2015 | Comments Off on When was the earliest ice breakup year for Western Hudson Bay polar bears? Was 1990 really the earliest ice breakup year for Western Hudson Bay polar bears – and why aren’t breakup dates derived from the same data identical? Two serious questions that need answering. The suggestion a few weeks ago by Andrew Derocher that the unusual breakup pattern of sea ice breakup in Hudson Bay this year might set a new record reminded me how often I’ve questioned the claim that 1990 had the earliest breakup for WHB since 1971. I call this date into question for two reasons: 1) sea ice maps and charts like those shown below suggest an early breakup in 1990 was not possible, by any definition of the term; 2) none of the research reports on WHB bears, for periods that included 1990, mention that breakup in 1990 was especially early, even though many commented (often at length) about the especially late breakup in 1992. How much does this very early breakup in 1990 contribute to the apparent declining trend in breakup dates since 1979?1 Is the early breakup date in 1990 real, perhaps a bizarre consequence of analyzing the data square-by-square over a grid? Or, were there errors in 1990 sea ice data that eventually got corrected by sea ice folks but not by polar bear biologists? UPDATE 17 June 2015 – PDF HERE of this post, with higher resolution images, for those who want to explore the questions I’ve posed or share them. 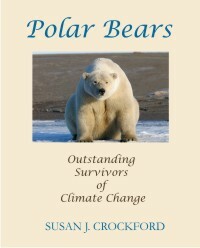 Four influential polar bear research papers (Stirling et al. 1999, Stirling and Parkinson 2006, Stirling and Derocher 2012, and Lunn et al. 2013) included a graph of breakup dates that I’ve copied here (Fig. 1, click to enlarge). They all used the definition of breakup as the point at which ice coverage reached 50% (on a square-by-square basis, for a grid laid over Hudson Bay). Note how much of an outlier 1990 is in all of the plots except for Stirling and Parkinson 2006 (upper right) – where 2003 comes out the earliest (almost two weeks earlier than 1990). Figure 1. Breakup dates 1975-2012, from Stirling et al. 1999, Stirling and Parkinson 2006, Stirling and Derocher 2012, and Lunn et al. 2013. Internal labels added by me; dates may be off by a day. Note how much of an outlier 1990 is in most of these plots, but also, the differences in dates for breakup in 2003. The two charts on the left used sea ice chart data calculated weekly; the two on the right used satellite data calculated daily. Click to enlarge. Another conundrum is that even using the same definition of “breakup” and the same data sources, the dates are not exactly the same. At some point, sea ice chart data from the Canadian Ice Service (produced weekly) were replaced by satellite data generated daily (Scott and Marshall 2010:156). The two charts on the left in Fig. 1 (Stirling et al. 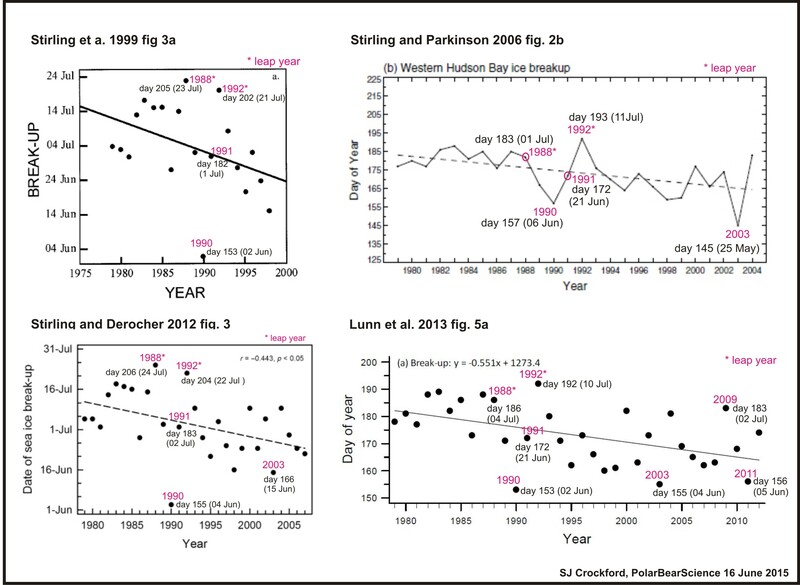 1999; Stirling and Derocher 2012) used weekly sea ice chart data, while the two on the right used daily satellite data (Stirling and Parkinson 2006; Lunn et al. 2013) – yet neither of these pairs have identical dates for breakup. The discrepancy that really caught my attention is 2003: in the 2006 publication (which used satellite data), breakup was 25 May (and thus markedly earlier than 1990) but was listed as 5 June in 2013 (also based on satellite data) – a difference of almost 2 weeks, using the same method! Based on ice charts, breakup in 2003 was determined to have been 15 June by Stirling and Derocher in their 2012 paper – 3 weeks later than the determination based on satellite data generated by Stirling and Parkinson in 2006! The differences in method might account for some of the discrepancy but it still seems unduly large. It means you definitely have to be very careful which paper you look at when talking about breakup dates, and note which method is used. In contrast, breakup dates for 1990 varied only slightly, from 2 June in 1999 to 4 June in 2012 (based on ice charts), and 2 June in 2013 to 6 June in 2006 (based on satellite data). Let’s return to the issue of 1990 being the earliest breakup year on record. A sea ice paper on breakup and freeze-up dates (Gagnon and Gough 2005), highlighted the area covered by the Western Hudson Bay polar bear subpopulation, showed 1990 as the earliest breakup date since 1971. 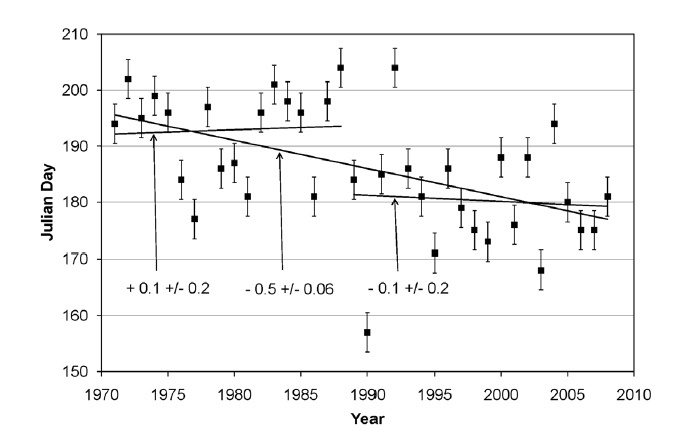 Another more recent analysis (Scott and Marshall 2010), revealed not a steady decline in breakup dates for 1971-2008 but a step change at 1988-1989 (copied as Fig. 2, below). It also showed 1990 as the earliest breakup date in that period. This suggests to me that if there was an error in sea ice data and a correction occurred, it likely took place after 2008. Seth Cherry and colleagues (2013) were looking for the definition of breakup and freeze-up that best described when WHB polar bears left the ice in summer and returned to the ice in fall. They avoided any problems in 1990 by starting their analysis in 1991, see Table 1 below (click to enlarge). A start date of 1991 struck me as odd at the time: 1992 had the latest breakup date on record – why not offset that late date with the earliest date on record two years earlier? The simplest explanation appears to be that there was no satellite collar data for females that year – 1990 fell between research projects. Because Cherry and colleagues could not determine precisely when the bears came ashore in 1990, they began with 1991 (dates onshore cited by Stirling et al. 2004 also began in 1991). There were WHB polar bear researchers in the field in 1990: there was mark-recapture work going on in the fall of 1990 (Lunn et al. 1997) as well as coastal surveys been done (Stirling et al. 2004), but no collars were deployed. Look at the CryosphereToday (University of Illinois) ice maps for 1990 on the date that Hudson Bay was supposedly 50% ice-free that year. I’ve paired 1990 with 1991 for comparison. Fig. 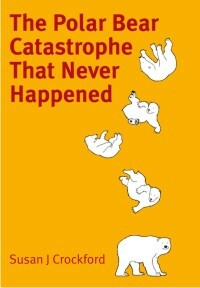 3 shows 1990 and 1991 at 2 June, the day polar bear biologists determined that breakup had occurred for 1990. The concentration level in Hudson Bay, especially in the SW portion, looks greater to me in 1990 than in 1991 (more dark purple). It’s hard to imagine how the coverage shown for 1990 qualified as 50% coverage (even taking concentration into account). Figure 3. 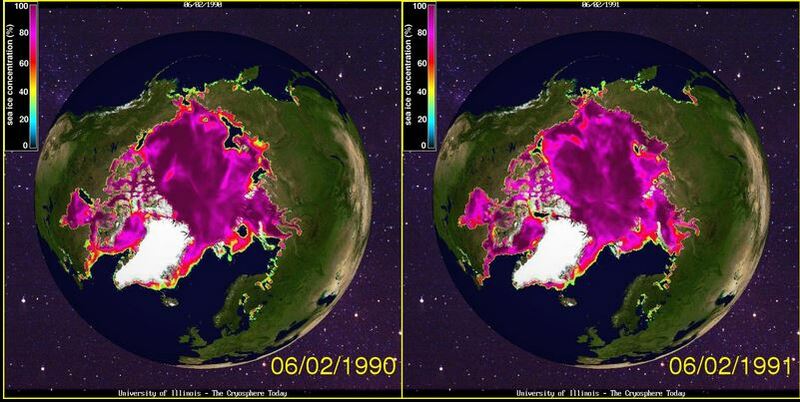 Sea ice concentration at 2 June 1990 (left) and 1991 (right). 2 June was the official breakup date for WHB according to Lunn et al. 2013, the most recent WHB polar bear report. Click to enlarge. Fig. 4 below shows the NSIDC ice chart for June 1990 (a monthly average which is usually very close to the coverage at the end of the month). 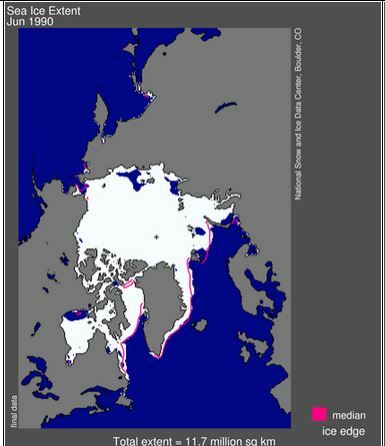 How was this amount of sea ice possible if breakup for WHB occurred in early June (cited variously as the 2nd, 4th or 6th, depending on the publication)? Figure 4. Sea ice extent average for June 1990 (end of June), according to NSIDC. 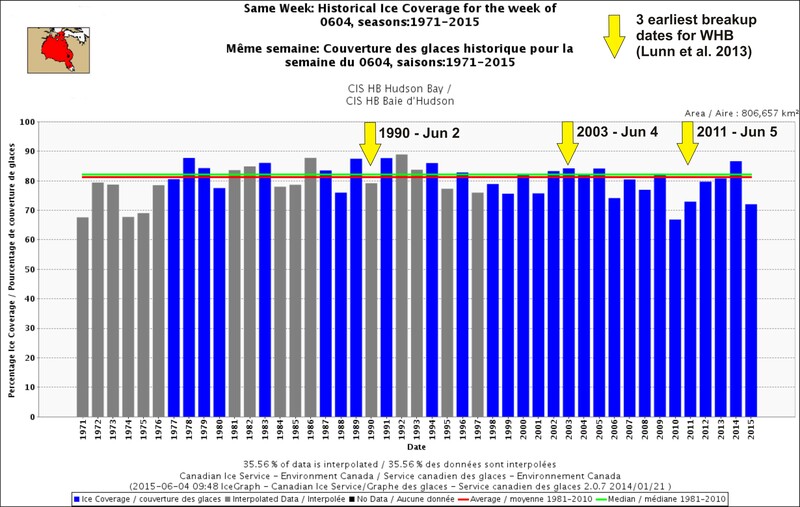 Breakup for Hudson Bay in 1990 was said to have occurred at the beginning of June (2-6), which just does not seem possible, this much ice showing as the June average. Click to enlarge. Figs. 5 and 6 below show Canadian Ice Service chart data back to 1971, for the weeks of 4 June and 18 June. They show that for the week of 4 June in 1990, there was almost 80% ice coverage and by 18 June, there was still about 60% ice coverage. These charts concur with the NSIDC and CryosphereToday data – breakup could not have occurred in early June in 1990. Figure 5. Sea ice extent coverage over Hudson Bay, by percentage, for the week of 04 June, 1971-2015. Three earliest breakup years marked, with the exact date when breakup was called using satellite data by Lunn et al. 2013. Note the amount for 1990 is estimated (grey) but is almost 80% coverage. Compare to two weeks later, Fig. 7, when data were more secure. Click to enlarge. Figure 6. Sea ice extent coverage over Hudson Bay, by percentage, for the week of 18 June, 1971-2014. 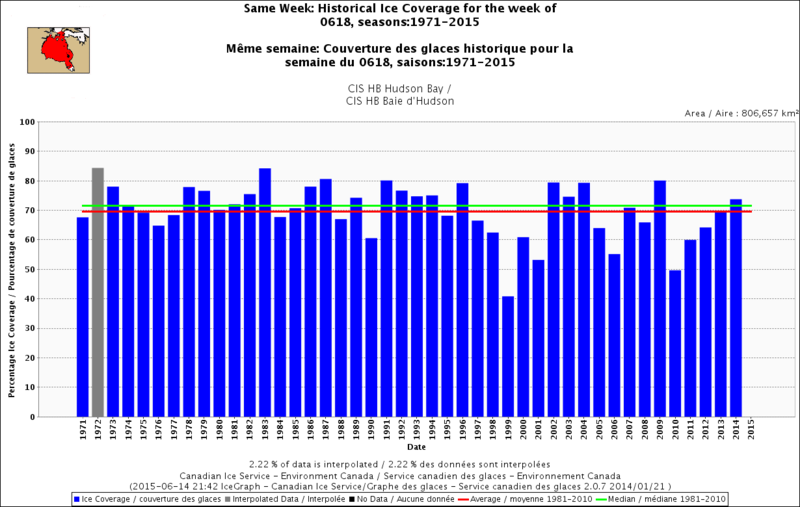 Note that 1990 ice coverage is down to about 60% over the entire bay, 2 weeks after “breakup” supposedly occurred. 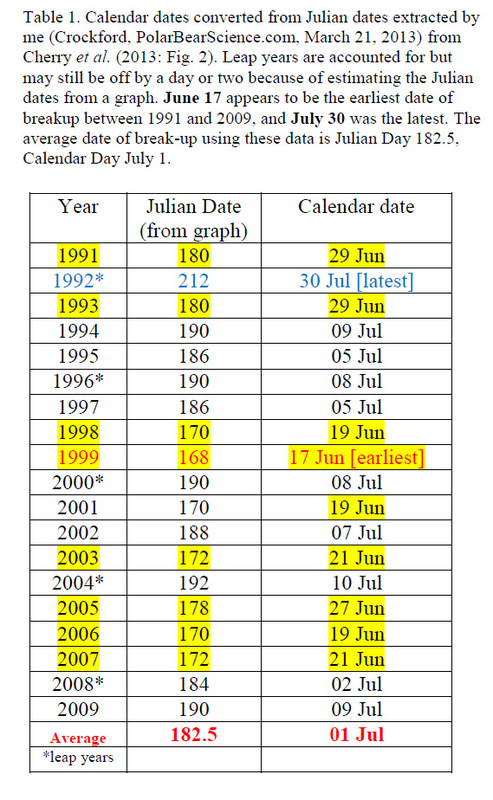 Note the position of 1999 at 40%, corresponds closely to Cherry et al.’s breakup date for that year as 17 June and the earliest between 1991 and 2009 (Table 1). Click to enlarge. None. Not a single one of the research reports on WHB bears, for periods that included 1990, mention that breakup in 1990 was especially early, even though virtually all commented at length about the especially late breakup in 1992 (Derocher and Stirling 1995; Stirling and Lunn 1997; Lunn et al. 1997; Stirling et al. 1999; Stirling et al. 2004; Stirling and Parkinson 2006; Regehr et al. 2007; Stirling and Derocher 2012). Stirling and colleagues (1999), working in the fall from 1981 through 1998, focused specifically on body condition and arrival dates of adult bears – yet they failed to mention 1990 as unusual in any way (their “dates ashore” graph for females with collars runs 1991-1997). Although shown in their sea ice data graph, the earliest-ever breakup event in 1990 is simply not mentioned. They did, however, talk a lot about the cold in 1991 and 1992. The same is true for Stirling and Lunn 1997. Stirling et al. (2004:20), who summarized data collected from 1963 to 1997 (and included sea ice data for 1971-2001), also showed a very early breakup date in 1990. Breakup in 1990 apparently occurred simultaneously in Western and Southern Hudson Bay (according to their graph), but the authors made no mention of that as unusual, or found that it correlated with an early arrival of bears on shore or a decline in the condition of the bears they counted. Stirling and Derocher (2012) mentioned that it rained in March 1990 in the maternity den region south of Churchill – but there was no mention of 1990 having an especially early breakup for WHB. What are we supposed to make of this? 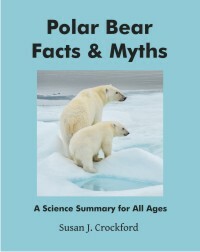 A number of the papers mentioned above made correlations between polar bear populations size, or health, and sea ice breakup dates. Despite their figures showing 1990 as the earliest breakup date since 1971 (Stirling et al. 2004), they don’t mention 1990 at all in their results or discussions. It’s actually quite bizarre. “Breakup” and “freeze-up” dates are discussed in the literature as concrete, scientific data points – but in reality, they appear to be highly variable and quite subjective assessments. These seasonal changes in sea ice are given great weight by biologists in assessing the population health of WHB polar bears – and for that reason, it’s critical for the data to be reliable and reproducible. I know that others have noticed the conundrum of 1990 as the “earliest breakyp year ever” but I don’t believe it’s been laid out for all to see before now. I’m convinced an impartial audit of WHB breakup data is necessary. Footnote 1. Stirling and colleagues (1999:298) found a slight decline in breakup dates between 1979 and 1998 but it was not statistically significant; there was also no trend in freeze-up dates for that period. Lunn et al. (2013: 15, 21) found no statistically significant trend in breakup or freeze-up dates between 2001 and 2010 (which almost certainly extends to 2014). That appears to agree with the conclusion of Scott and Marshall (2010), who found a step change at 1988/1989 (Fig. 2). This begs the question: if 1990 was not especially early, is there any negative trend at all? Cherry, S.G., Derocher, A.E., Thiemann, G.W., Lunn, N.J. 2013. Migration phenology and seasonal fidelity of an Arctic marine predator in relation to sea ice dynamics. Journal of Animal Ecology 82(4):912-921. Stirling, I. and Lunn, N.J. 1997. Environmental fluctuations in arctic marine ecosystems as reflected by variability in reproduction of polar bears and ringed seals. In Ecology of Arctic Environments, Woodin, S.J. and Marquiss, M. (eds), pg. 167-181. Blackwell Science, UK. Stirling, I. and Parkinson, C.L. 2006. Possible effects of climate warming on selected populations of polar bears (Ursus maritimus) in the Canadian Arctic. Arctic 59:261-275. http://arctic.synergiesprairies.ca/arctic/index.php/arctic/issue/view/16. This entry was posted in Sea ice habitat and tagged audit, breakup, decline, open-water season, polar bear, satellite data, sea ice charts, western hudson bay. Bookmark the permalink.